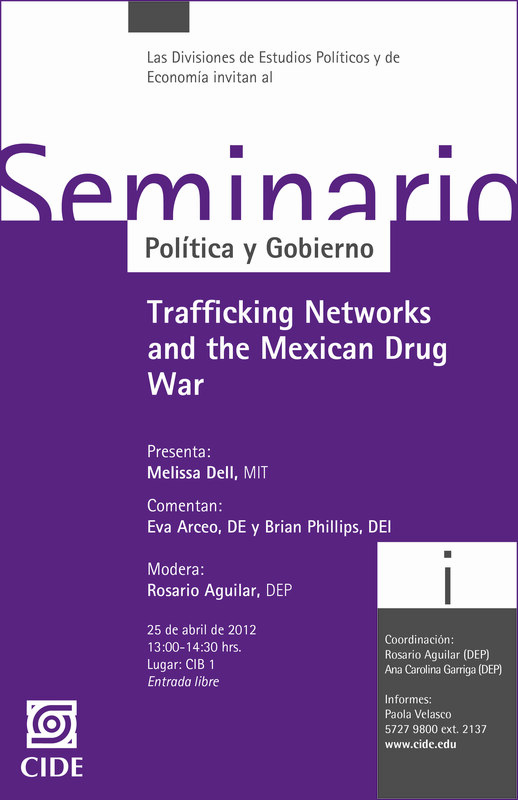 “Trafficking Networks and the Mexican Drug War“ (appendix), de Melissa Dell (MIT). Abstract: Drug trade-related violence has escalated dramatically in Mexico during the past five years, claiming 40,000 lives and raising concerns about the capacity of the Mexican state to monopolize violence. This study examines how drug traffickers’ economic objectives influence the direct and spillover effects of Mexican policy towards the drug trade. By exploiting variation from close mayoral elections and a network model of drug trafficking, the study develops three sets of results. First, regression discontinuity estimates show that drug trade-related violence in a municipality increases substantially after the close election of a mayor from the conservative National Action Party (PAN), which has spearheaded the war on drug trafficking. This violence consists primarily of individuals involved in the drug trade killing each other. The empirical evidence suggests that the violence reflects rival traffickers’ attempts to wrest control of territories after crackdowns initiated by PAN mayors have challenged the incumbent criminals. Second, the study accurately predicts diversion of drug traffic following close PAN victories. It does this by estimating a model of equilibrium routes for trafficking drugs across the Mexican road network to the U.S. When drug traffic is diverted to other municipalities, drug trade-related violence in these municipalities increases. Moreover, female labor force participation and informal sector wages fall, corroborating qualitative evidence that traffickers extort informal sector producers. Finally, the study uses the trafficking model and estimated spillover effects to examine the allocation of law enforcement resources. Overall, the results demonstrate how traffickers’ economic objectives and constraints imposed by the routes network affect the policy outcomes of the Mexican Drug War. Fecha y lugar: 25 de abril de 2012, 1:00-2:30 pm, Sala CIB 1. Aquí encontrarán más papers de Melissa Dell. No puedo creer que no me enteré a tiempo. Su paper es muy interesante. ¿Habrá algún video o comentarios de su seminario?